Little Free Libraries are a global phenomenon. 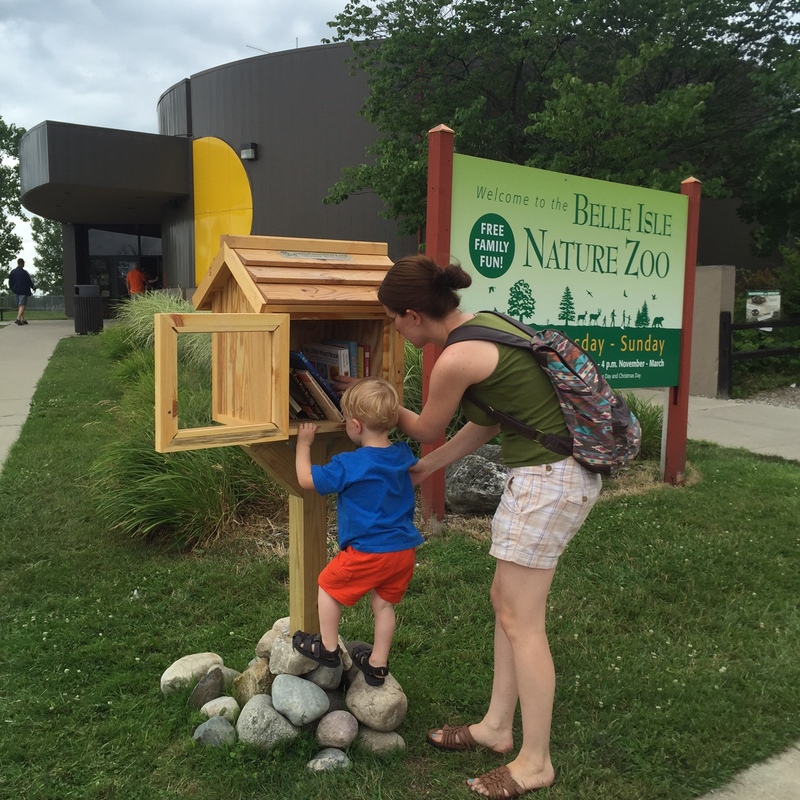 These small, front‐yard book exchanges number nearly 40,000 in all 50 states and around the world in 70 countries — from Iceland to Tasmania to Pakistan, and now, the Belle Isle Nature Zoo! We’ve joined the movement to share books, support literacy, bring people together and create communities of readers. What is a Little Free Library? Little Free Libraries are hand-crafted structures filled with constantly changing collections of books donated and shared by people of all ages and backgrounds. Each year, nearly 10 million books are shared in Little Free Libraries. 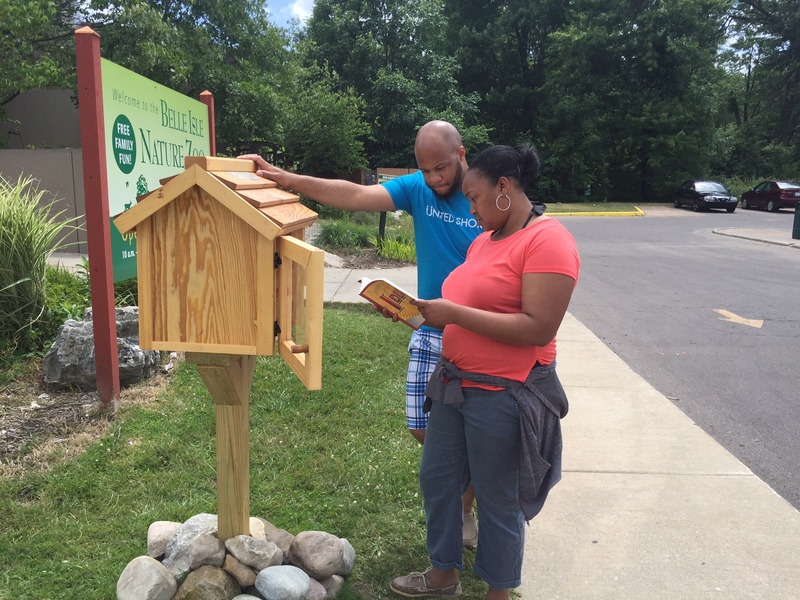 Just a few weeks ago, the Belle Isle Nature Zoo chartered and then planted a Little Free Library and seeded it with books. We’ve already observed the community and literacy-building movement blossom into a fun and shared experience for our visitors. More than 100 books have already gone home with our guests from Metro Detroit and other neighborhoods around Michigan, as well as some out-of-state visitors. Additional books for children and adults have been lovingly placed upon the shelf, shared by friendly donors, and the collection is ever-changing. We’ve been added to the Detroit Little Libraries map as well, supporting the 313 Little Libraries action plan toward making Detroit the Little Free Library capital of the world. The 313 Little Libraries action plan has a priority of planting libraries in areas with low access to books, with a special focus on places where children congregate, supported by research that shows access to books is a powerful indicator of success in school. Not only might our guests find a great book to take home and read (and then return or share with friends) the Little Free Library provides an opportunity to give back. It allows people who want to volunteer in some way a chance to donate books and know that they are contributing to the literacy and leisure of their community. One of the best parts about Little Free Libraries is that they don’t require library cards or late fees, don’t insist that patrons whisper or stay quiet, and don’t mind if you do not return a book. At the Belle Isle Nature Zoo, we are known for being stewards of nature, providing experiences that build awareness toward our local ecological health and sustainability. We are pleased to also be stewards of our neighborhood literacy and building community, offering opportunities to share good things to read with one another. It’s truly everyone’s library, and the more people who participate, the better!